A few weeks ago, I was a featured artist on Art Motif Magazine.org. Here is an excerpt from my interview. Read the full interview here. My art is and always has been an expression of the ideas in my head and a means to find peace during stressful times. When I used to work full time in an office, I would create art after work, on the weekends and during my lunch break. Ever since I started to pursue art full time, I have been able to spend a lot more time on my art. These days, art just flows out of me. I would say that since I paint and draw so much, I almost spend more time creating than not. My art is an energy that escapes through my hands. Are there any themes you gravitate towards more in your works? I tend to gravitate towards desert themes and feminine illustration. The desert theme is quite new to me. I started exploring the theme two years ago when I moved to Tucson from LA. It was something new that I grew to love. My desert art is a snapshot of this moment in my life. Feminine portraiture is also one of my favorite subjects and has been for as long as I can remember. I like drawing women from different cultural backgrounds because I like representing different narratives in my art. All people and cultures have their special and unique characteristics and I think that it’s important to recognize and celebrate our differences. Do you have any favorite painters? I tend to prefer stylized works of art over realistic ones because I feel that stylized artwork provides an interesting lens into the artist’s worldview. To me, stylized art is a unique expression of how an artist sees the world. I think there is beauty in exploring how an artist’s life, personality and perspective impacts their work. Having said that, my absolute favorite painters of all time are Vincent van Gogh and Frida Kahlo. I love van Gogh’s use of color and his amazing brushwork. His world is vibrant and mirrors the spirit of his reality. I am very much influenced by his art when I work with acrylic paint. Frida Kahlo’s art is filled with raw emotion and surreal imagery. It is brave and unapologetic, just like she was. Frida’s work inspires me to incorporate my own personality and whimsical concepts into my feminine portraits. 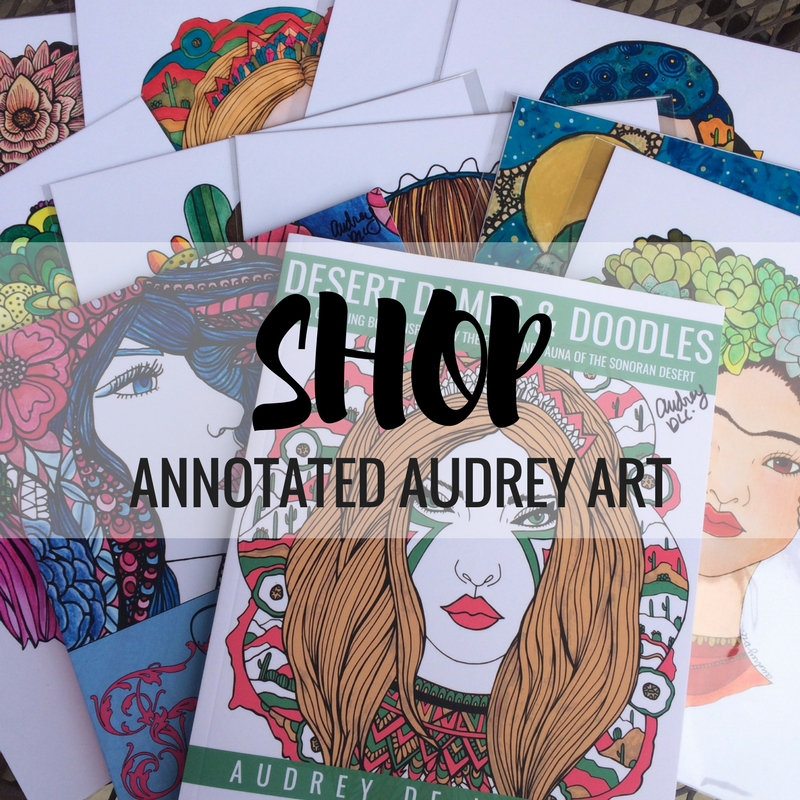 Sign up for our Annotated Audrey Art VIP Club to receive updates, exclusive coupons & more. We will be closing up the online shop from March 9-21st… but before that we are having a sale! Enjoy offering free shipping + a free surprise gift with any purchase through March 8th! Thanks so much for reading this post and for following my creative journey.